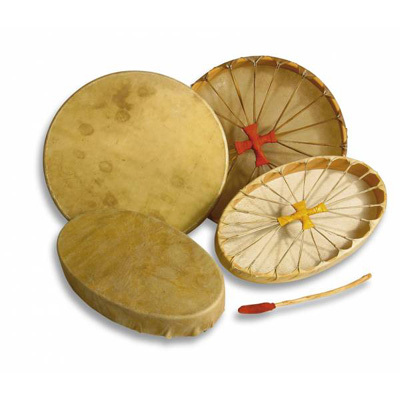 Our sweat lodge drums are only made out of natural skin (cowskin) and wood (beech). On the back of the drum, 16 hide ropes are combined in 4 segments each. They are wrapped in leather for comfortable handling. Comes with a mallet with a red leather head filled with sheep wool. The oval symbolises the power of the eliptical form, the movement of the earth around the sun. The oval allows a great diameter which still can be hold close to the body. Our sweat lodge drums are only made out of natural skin (cowskin) and wood (beech). On the back of the drum, 16 hide ropes are combined in 4 segments each. They are wrapped in leather for comfortable handling. Comes with a mallet with a red leather head filled with sheep wool. The round drum symbolises the universe and the circle. The oval symbolises the power of the eliptical form, the movement of the earth around the sun. The oval allows a great diameter which still can be hold close to the body. There are many different sweat lodges in different cultures used in different ways. Drumming, singing and contemplation add to the cleansing properties of heat and steam. The heat is created by stones heated in a fire outside the lodge until they are glowing red and carefully placed in a special hole in the lodge. There the water is poured over the stones creating humidity in the lodge. The drums that are used inside the lodge have to be built in a special way to be able to hold their tension with the moisture for the duration in the lodge.